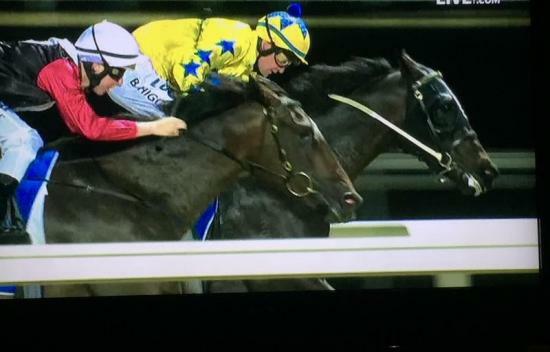 Sent for a break in order to mature after an unplaced debut at Mornington last October, promising three-year-old Jawsome took no time at all to find form this time in - at Pakenham on Thursday night leading throughout to record an impressive maiden victory. Showing plenty of natural speed under the guidance of Brian Higgins, the son of Sharkbite began fast and was always travelling nicely, giving a kick into the straight and finding plenty when challenged late. "He has come up really well this preparation," Allison Sheehan said, noting that the addition of blinkers to the gelding's gear has helped him concentrate. "He was just very new last time in, he has just needed confidence - but he has come on well and I am sure he will take further improvement out of this win." Allison joked that she felt more tired after the race than did her horse - "it is a very long straight here and myself and a few owners were up there cheering, we were a bit out of breath by the time he got to the winning post!" Allison was delighted to win for her fellow owners of Jawsome (Bryan Cain, Mrs Mary Cain, Brendan Cain, Chris Cain, Brian Slade, Miss Corinne Slade, Stephen Kerr, Mrs Jacqueline Kerr, Mrs Diana Gray, Chris Gray, Mrs Amanda Gooden, Martin Penny, Mrs Colleen Wray and Alan Wray), noting that "I have had a lot of winners for Bryan and his family, this is the 15th over the past few years." "Hopefully he can kick off from that and end up as good as his sister," she said - a nice tip for those who were listening with Jawsome's sister Andrassy saluting at juicy odds at Caulfield a couple of days later! Brian Higgins was impressed by Jawsome's performance and is also confident that he has more to offer. "He is a bit of a thinker, he just waits a bit and doesn't really like having horses around him so I just rode my own race on him and he held on well. He had a good blow and will take improvement from that." Jawsome is the second foal produced by the lightly raced three times winning Desert Sun mare Pride Of Ardrossan whose dam Royal Sencherec ran second to Crystal Palace in the 1997 Queensland Oaks. Andrassy, also by Sharkbite, is her first foal and she is in foal to Canford Cliffs having produced a stunning Skilled filly last September.